Gone are the days when laundry rooms were just a small corner in a dark, dank basement or a small closet near the kitchen. Now, laundry rooms are fully customized for style, comfort and utility. Indeed, a well-organized and styled laundry room can increase your own happiness with your home while adding value. Knowing this, you want to ensure you take into account several key items when ordering or upgrading your custom laundry room cabinets. Whether your laundry room is just large enough for your washer and dryer or the largest room in your house, you want to ensure you make the most of your storage space. In small spaces, build cabinets above the washer and dryer, or for greater space efficiency, add pedestal cabinets below your washer and dryer. Location, location, location! Where you place your cabinets, and at what height, can mean the difference between utility and futility. Do you want cabinets or shelves directly over your washer and dryer to hold necessities such as detergent and fabric softener? Do you want room to fold your laundry? Do you want both upper and lower cabinets? Thinking about placement can help you better define your overall goals for your laundry room before you even meet with your cabinet maker. 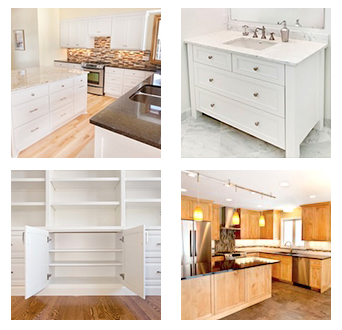 These are a just a few examples of how you can take the customization of your cabinetry to the next level. If you want more ideas, speak to a designer with specific experience building for laundry rooms. Cabinets come in a variety of styles and materials. One question you want to ask yourself is whether you want your laundry room cabinets to match the style of your kitchen cabinets or if you want to make a statement. Discuss your options with your designer to determine what options are available to you. Color invokes feelings. The combination of your stain or paint color on your cabinets and the color of your walls and even floors can help to invoke how you want to feel when you enter your laundry room. Do you want to feel serene and peace? Do you want to feel energized? Thinking about these items can help your cabinet designer develop a full plan and proposal that brings your dream laundry room cabinets to life. What Other Items Matter to You? The items suggested above really are just the tip of the iceberg when it comes to designing and installing custom laundry room cabinets. We’d love to hear from you what items matter most to you during this process. Leave a comment below or give us a call today at 952-737-7088.